An evaluation of last summer’s Worcester Stands Tall (WST) giraffe art trail has revealed it provided a boost of more than £800,000 to the city. Studies by MEL Research, funded by Worcester BID, revealed WST app users alone spent £104,200 to £156,000 in the city during the trail which ran from July to September 2018. Footfall figures from Crowngate Shopping Centre and the Tourist Information Centre reveal an increase of 44 per cent compared to the same period in 2017 – and based on average spend this could have contributed a boost of up to £846,000. Meanwhile, a net profit of £233,000 was raised for the hospice’s Build 2020 Appeal – a project which will create savings for the county’s health economy. 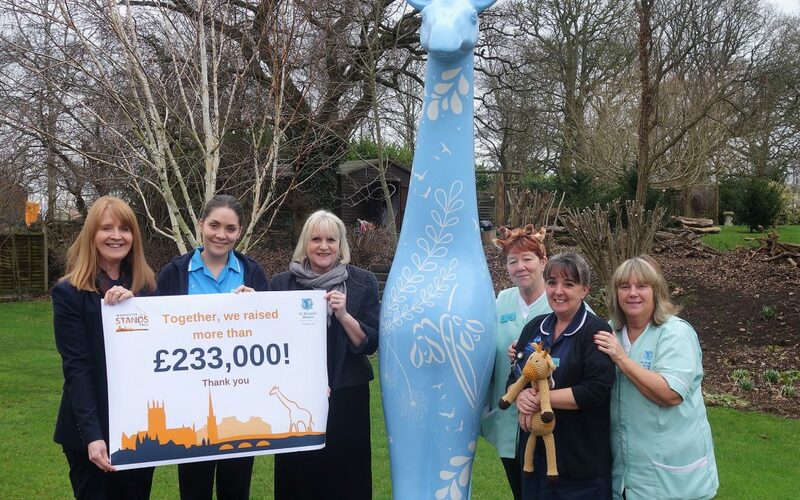 Tricia Cavell, hospice Fundraising Director, said: “We are thrilled to see how much value our lovely giraffes brought to the city last year. “We already knew the sculptures were very well loved by the community here in Worcester – but to understand the level of positive impact the trail had on areas such as the city’s economy and tourism is just fantastic. The survey also showed 99 per cent of app users rated the trail positively and 71 per cent explored parts of the city they wouldn’t normally visit. In addition, a total of 99 per cent of those responding to a survey of city businesses said the trail had a positive impact on their revenues. The WST auction at drp Group in October 2018 saw 31 sculptures sold for a total £210,400. This followed the 10-week trail featuring 57 giraffes from July to September. WST was a Wild in Art project, brought to the city by St Richard’s Hospice. The trail was supported by presenting partners Worcestershire Ambassadors and Crowngate Shopping Centre, education partner West Midland Safari Park and media partners Free Radio and Worcester News. St Richard’s Hospice cares for adults with a serious progressive illness, improving their quality of life from diagnosis, during treatment and to their last days. It also supports their loved ones. Each year the hospice team supports more than 3,300 patients, family members and bereaved people in Worcestershire. St Richard’s is also raising funds for the Build 2020 Appeal to build a bigger hospice, enabling more patients and families to be cared for in Worcestershire.The total cost for expanding and redeveloping the existing building in Wildwood Drive, Worcester, is £5.3m.